Achieving Quality and Value on Time | Excel Construction Ltd.
Excel Construction Ltd's dedication to succeed in its projects is based on a solid commitment to values of integrity and teamwork. We work with organizations and individuals who share these values. 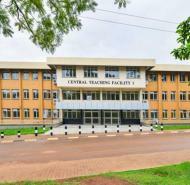 Construction of central teaching facilities,refurbishment of old laboratories in Makerere University,Kampala Construction of 2 new teaching facilities and rehabilitation of existing laboratories.